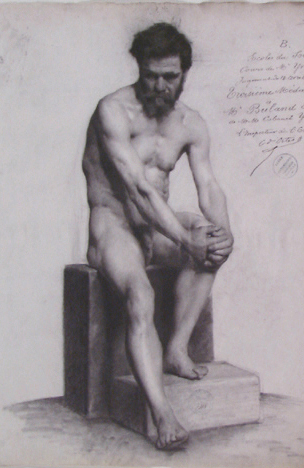 Many consider figure drawing to be the holy grail of representational art. We are figures, so it's natural that we are drawn to use the figure to explore the many facets of our human condition. Even in itself, drawing the figure is a humbling challenge that can be approached in many ways. Figure drawing can be approached from a place of knowledge, observation, and interpretation. These three approaches are most effective when used in combination with one another. Each approach adds a unique dimension to the drawing process, and to the drawing itself. 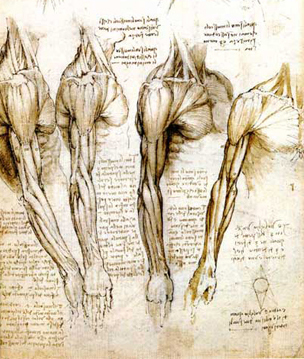 -the muscular anatomy of the body and how it relates to the skeleton (where the muscles originate and insert on the skeleton, how they move their respective areas of the body, and the like). How does this knowledge improve your drawings? It adds a logic and believability, and helps you create the illusion of three-dimensionality and solidity in your figures. You also gain the freedom to create the figure (at least partially) from your imagination and memory. While drawing from memory may not be your ultimate goal, it's an extremely useful skill, particularly when something is unclear or obscured on the model. This happens more often than you might think! When this occurs, your knowledge will allow you to "fill in the blanks" instead of being completely dependent on what you can see. You will also be able to "edit" the figure in front of you when drawing from life, and alter it in ways to better suit the intent of your picture. Drawing from observation can infuse our pictures with vitality and life. It gives us the opportunity to notice the unique, unpredictable moments that occur in life: the rhythms, subtle fall of light, imperfections, oddities, and specifics that add character and individuality to a model or drawing scenario. No two drawing scenarios are the same! Even two sittings of a model in the same pose are not identical. We just have to become sensitive enough to notice the differences. This is why relying purely on knowledge and memory drawing, without observation, can produce a drawing that is structurally correct, but generic, as it will lack these unique moments that must be observed and experienced. Another reason to draw from observation? You can never predict what will inspire you until you see it! That is such an exciting part of drawing: that potential to see something that moves you to want to communicate it. However, observation cannot replace having an understanding of what you see. Observation becomes most sensitive when complemented with a knowledge of the figure, because it is much easier to see what you know is there. A lack of understanding of the structure and anatomy of the figure often results in poor construction that looks unnatural. Relying on observation without understanding what you see is like learning to pronounce a foreign language without understanding what you are saying. Drawing is not (or should not be, in my opinion) merely mimicking or copying. It is a means of communication, and we cannot effectively communicate what we do not understand. Hopefully I have convinced you to develop both your knowledge and your eye for figure drawing. However, I would like to point out that this formal study can be a means to an end, and not necessarily an end in itself. Ultimately if we use our knowledge and skills to interpret the figure, it can become a unique and personal form of self-expression. What fascinates me about the human figure? Why am I compelled to draw it? What is meaningful to me, that I am driven to communicate? What will the figure help me express in my artwork? Even if you are unable to concretely answer these questions, just considering them may guide you in new, more personal directions. 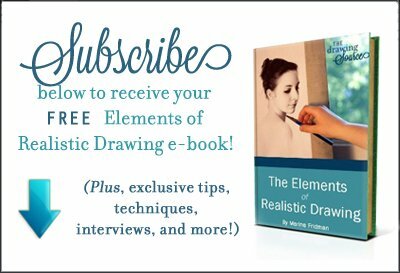 As fascinating as the study of figure drawing is in itself, it can be even more engaging, both for you and your audience, when it also becomes a study of yourself and the world around you.